This post is the last entry in Mayim’s month-long series about the Jewish aspects of divorce. As a child, I lit two Shabbat candles with my mother every time she lit Shabbat candles. I felt like a little Ima (mother), like they make you pretend in preschool or kindergarten Hebrew school. It’s practice, you know. For when you are a “real” Ima. Imas light two candles. When I got married, I had not been consistently lighting Shabbat candles for years. After leaving my parents’ home and going to college, I stopped, but I would light them with the other girls at Hillel when I attended services there and looked forward to a day when I would light them as a married woman. I bought antique Victorian candlesticks for my wedding. I was not the typical Jewish girl so I didn’t buy the typical expensive silver kind that many religious girls dream of. Lighting candles as a married woman was very nice and gratifying. I felt I was creating light for me and my partner in a sacred space. When my first son was born two years after I was married, I added a small candle for him, as is the custom; one for each additional child. That first time I lit that little candle for my son was a very special Shabbat. My husband and I blessed him so that he be like “Menasseh and Ephraim,” and we stumbled over the Hebrew, so new to both of our lips. Since I had grown in observance in college, I had seen so many women lighting one for each of their children as I became more observant, imagining that one day–God willing–I, too, would light many candles for my many children. I am now a divorced mother of two. My sons are accustomed to lighting their own candle every Shabbat since they were old enough to hold a match. “I want to light my candle!” they remind me as we set them all up on Friday nights. The first time I lit candles and blessed my sons after I was alone in my house with no husband was a very complicated and emotional experience. It’s not something I ever wanted to do alone. But I am doing it. It’s very hard. It occurred to me a few months ago–the first time my sons referred to the second candle I light as “The Dada Candle”–that maybe divorced women don’t light two candles anymore. Maybe we are supposed to retreat back to the tradition of being single and lighting a single candle for ourselves, as is the custom among religious women. After some investigation, I found out that the halachic answer is that divorced women still light two for themselves. I wish that I could stop crying when I look into their eyes and ask that they be like Menasseh and Ephraim. I wish that I could stop my voice from shaking when I ask that God bless them and keep them and cause the Countenance to shine upon them and always give them peace. I sometimes wish this wasn’t my life. I wish that God should bless me and keep me and that God’s Countenance will shine upon me and always give me peace. And I wish that for my son’s father, too. Because when he has them on Friday nights, he stares into the same eyes I stare into. And one son has my eyes and one son has his eyes. And the “Amen” we say is the same. No matter what house you say it in. 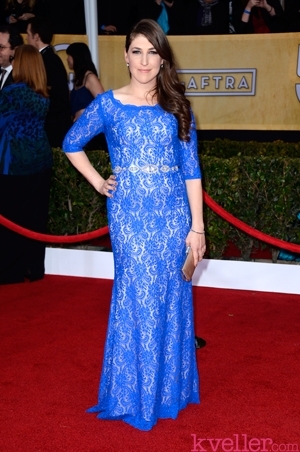 Love Mayim? Get her latest blog posts delivered straight to your inbox.